Holy Trinity School in Upper Tooting, was last mentioned on the blog with regard to the pupils knitting socks for soldiers in August 1914 – an endeavour which presumably continued but unfortunately isn’t regularly noted in the school log books. The school was affected by the war in other ways, one of their teachers – D J Davies – was called up to the London Welsh Regiment in October 1914 and did not return to the school until February 1919, by which time he had been awarded a Military Cross. He took a day off to formally receive it in June 1920. Another teacher, John Moody left to go to Malta in September 1914 with the territorial army, he was killed on 1 July 1916 (the first day of the Battle of the Somme) and is commemorated on the Thiepval Memorial. Assistant A C Swain was called up in June 1916, returning to school in March 1919, and another assistant, B C Moore, went for medical examinations but was presumably found unfit to serve, as he remained the school for the rest of the war. The pupils also continued to contribute to the war effort, including being part of the fundraising across Wandsworth Schools for an ambulance. On 17th April, the ambulance visited the school so that “the boys might see it and its arrangements before going to France”. The Wandsworth Borough News referred to it as a “splendidly equipped ambulance”, having followed the progress of its fundraising in previous weeks. It was to be presented to the “Mayor’s battalion” and visited all the schools across Wandsworth. The Mayor himself was unable to go with it, being occupied with the Tribunals, but Alderman Cresswell and Miss Edwards, who had organised the fundraising, went round the schools instead. The ambulance wasn’t the only disruption to the timetable that morning. 2016 marks the four hundredth anniversary of the death of Shakespeare, and you would be forgiven for assuming that the tercentenary in 1916 was over-shadowed by the war and perhaps not marked. In Holy Trinity School, however, it was marked with Shakespeare songs and recitations, and on the same day as the ambulance visited the last two lessons of the morning were cancelled for standards 1, 3, 4, 5, 6 and 7 in favour of a combined practice of the Shakespeare songs for the tercentenary. St Andrew’s Presbyterian Church of England on Battersea Rise produced a monthly magazine known as the “St Andrew’s Review”. 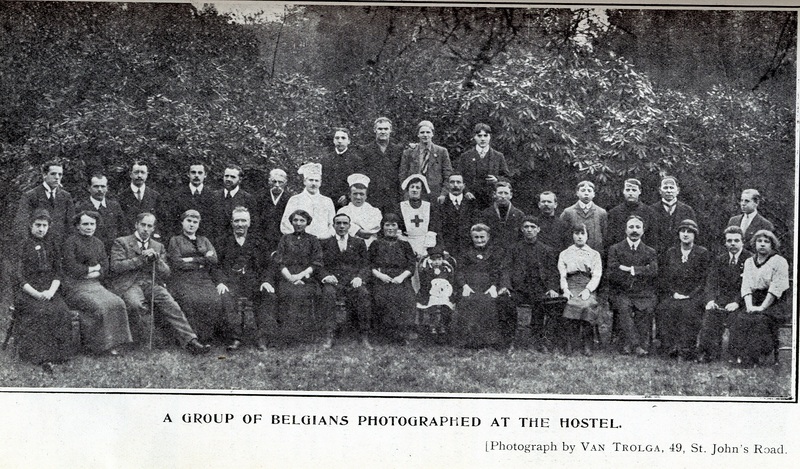 The May 1915 edition contains the first in a series of columns headed Belgian Notes, giving news on the Belgian Hostel at 83 Clapham Common West Side. 83 Clapham Common West Side had been a private school before the war, although a small one with eight boarding pupils recorded on the 1911 census. It was run by a Harriet Bridgeman, but from 26 October 1914 the rate books record it as occupied by Belgian refugees. A further note also specifies that the property was not to be charged rates, as per a letter from the Town Clerk. There is a gap in the rate books between 1915 and 1922, by the later date the property was back in private hands and it is not clear who actually owned it when it was being used as a home for refugees. The first mention of the hostel is in the December 1914 edition of the St Andrew’s Review. An article written by one of the refugees, John Carnas, gives an account of being called up by the Belgian army, being injured and invalided out, then having to leave Antwerp as the Germans had started to bombard the city. He initially went to Paris but was unable to find work, then went to Calais where the refugees were not allowed to spend longer than 24 hours, at which point they decided to cross the Channel and came to London, “where we had a reception fit for a king… Here we are now in our comfortable resting place at 83 West Side, Clapham Common, where the ladies and gentlemen of the Committee do everything possible to make us happy”. The next update is in this month’s Review. A recent concert had raised just over £30, but the cost of maintenance worked out at a little over 6/- a head (although for how long is not given), with 40 guests in the hostel at the time of writing and as many as 47 in the past. Due to the “increased cost of commodities” an increase in income was also required, and the Committee were hoping that local residents might be able to start regular door to door collections in their own roads. Taking place this week was also the regular meeting of Wandsworth Council, where it was reported that the Mayor had been asked by the War Office to oversee the raising of a local battalion for the regular forces (as opposed to the Territorials). Offices for recruiting were to be set up at the Town Hall and 380 Streatham High Road. This was what became the 13th (Wandsworth) Battalion of the East Surrey Regiment and we’ll be coming back to it in upcoming blogs. 23 members of the Putney Ward Committee for the War Relief fund met in Putney Library on 27 August 1914, with apologies from a further 5. Like last week’s all-borough Committee meeting, this was clearly still a popular cause. The first item of business was actually a resignation – perhaps a rather unorthodox start, but Mrs Cooper-Rawson gave her involvement with organising the work of the local Red Cross as her reason for not being able to act as a committee member. Largely the meeting was concerned with membership and set-up – we’ll return to it in a few weeks when they start dealing with requests from local people. The Wandsworth Borough News carried several stories relating to the war and opportunities throughout the borough. Adverts encouraged Wandsworth recruits to report to 6 Beamish Road, 467 York Road or 157 Tooting High Street, and the 23rd Battalion London Regiment advertised for “good, smart recruits” for the Territorials. Collections for the local relief fund by the Free Churches of Wandsworth had taken place and a man claiming to be Rudolf Francis Karl Josef Hapsburg, Crown Prince of Austria was arrested and charged for not registering himself as an enemy alien. His real name was Christian Paul Klave and he had previously claimed to be a Russian count whilst running a dogs’ hospital in Streatham. The Tooting Local Relief Committee had a dispute over their appointed Chairman (Alderman W Hunt), including one objection to having a Chairman at all – an issue not fully resolved by the end of the meeting. Perhaps in response to this, there was also an unsuccessful motion to exclude the Press from future meetings. The Borough News also carried adverts encouraging people to take account of the war in their shopping. S Frost & Company announced “normal prices again in nearly all Departments”. Daniel Neal & Sons encourage the “many who are deterred from reasons beyond their control from answering Lord Kitchener’s Call” to still exercise, and more to the point to buy new football boots. 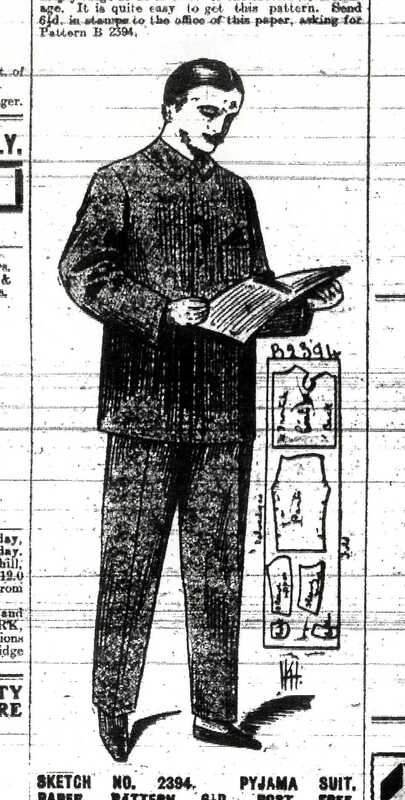 Advertised under the guise of practicality as “For the soldier lads – a garment that will be needed both for the Front and in the home” was a pattern to allow people to make pyjamas for soldiers – “In suggesting garments for these brave men, so no one would dream of leaving out the pyjama suit. This is one of the most necessary of all the garments required”. Proposed material was flannel, flannelette or wincey, with the suggestion that silk might not be so practical. The pattern could be obtained from the News offices, and the finished result would hopefully resemble the picture below.